Tourist attractions of Bangladesh are many sites which include archaeological sites,historical mosque,monuments,resort,beaches ,forests,picnic spots,tribal peoples and wildlifes of various species.Bangladesh offers many opportunities to tourists for angling,river cruising,hiking,rowing,water sking,sea bathing as well as bringing one in close touch with pristine nature. 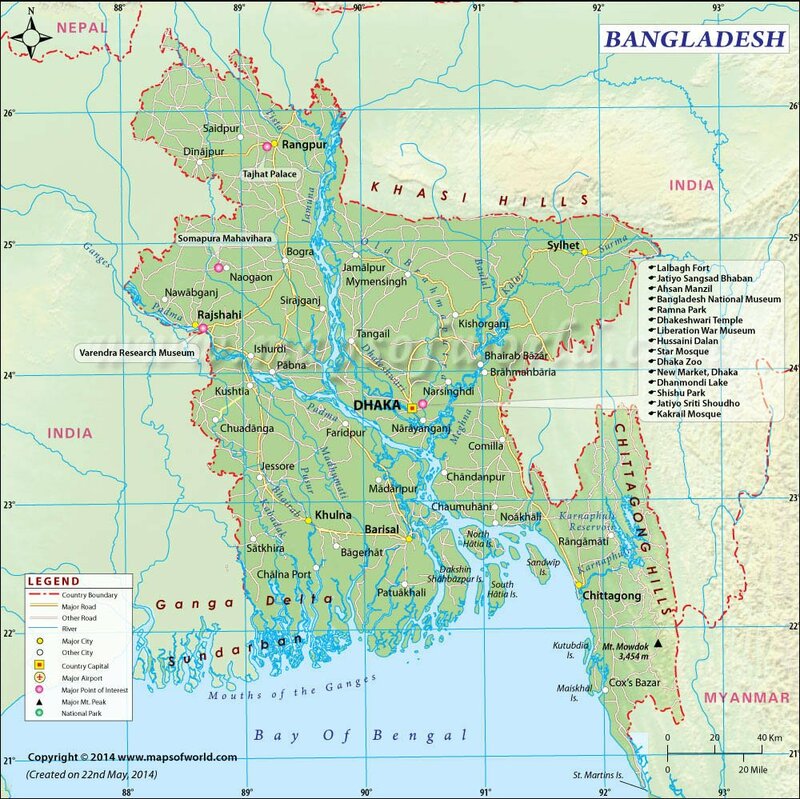 Location in the north-eastern part of the south Asia,Bangladesh lies between 20º34' and 26º36' north latitude and 88º01' and 92º41' east longitude.The mejore part of Hymalaya stand some distance to the north while in the south lies the Bay of Bengal.The gangetic plains of west Bengal Border the country on the west and in the lie the hilly and forested regions of Tripura,Mizoran and Myanmar.These geographica boundaries frame a low lying plain of about 147570 sq.km cress-crossed by innumerable rivers and steams.Mejor rivers the Padma,the Brahmaputra ( Jamuna ) and the Megna and Karnafuly.This is Bangladesh,a fertile land. Bangladesh is characterized by a unique coming together of many races,languages and religions.Its culture is a distinctive composite to which Jains,Buddists,Hindus,Vaisnavas and Muslims have all contributed.From time to time Bangladesh searches for its roots as if trying to put back the missing parts in its long history. Bangal was the wealthiest part of the subcontinent till the 16th century.The area's early history featured a succession of Indian empires,internal squabbling and a tussle beween Hinduism and Buddhism for dominace.All of this was just a prelude to the unstapple tide of Islam which washed over northern India at the end of 12th century.Mohmmad Bakhtiar khalzhi from Turkistan captured Bengal in 1199 with only 20 men.Many companies came here from aboard for reign this country.Europeans began to set up trading posts in the area of Bangladesh in the 16th century,eventually the British came to dominate the region and it became part of British India.British reigned this country 200 years at a time but in 1947,West Pakistan and East Bengal ( both primarily Muslim ) separated from India ( Mainly Hindu ) and jointly became the new country of Pakistan.Then west side is called west pakistan and east side is called east pakistan.After nine month fighting with west pakistan,east pakistan became independent and built a new state named Bangladesh.